Israel existence after 66 years: from a legitimate goal badly realized to the need of reconciliation. “An eye for an eye will make the whole world blind”, said Mahatma Gandhi. And the world has been blind already so many times and for so long periods in its history that it unfortunately got accustomed. Nevertheless, sooner or later, humankind miraculously always recuperates its sight. Is it time for the Middle East to do so? May be, but we need a cultural revolution for that. The conflicts that we have lived since the beginning of our history until the modern times, from the wars that characterized the Empires of the past (Europe docet) to the wars that have destroyed the Middle East since generations, demonstrated that human beings have still a strong instinct of revenge. The ‘eye for an eye’ vision (stumped in the Bible as a symbol of justice later becoming more a symbol of hatred) creates an escalation that cannot be stop, as the eye that has been taken away cry for revenge in a never ending violent cycle. It is unfortunately a logic and natural law, until we stop this cycle. This vision also creates the belief that we are the only ones to be victimized and that justice is something that can be made only from one side, ours, forgetting about the suffering of the others. So following the ‘eye for an eye’ concept finally our legitimate goals lose their legitimacy, as from being rights become in reality impositions. The Zionism had its legitimate goal since the beginning of its foundation: to find a place for the Jews and liberate them from the anti-Semitic discrimination and persecutions lived for millennia in their diaspora. We could argue that there are other groups, like Romani people, that have also been discriminated and persecuted during all their history and have never been interested in the ownership of a land. But this is another discourse that has to deal with the identity of every culture and so we are not going to analyze it here. The birth of an Israel state, not only for the Shoa, had its reason and legitimacy. But the way in which Israel put that right in practice made it less defendable. The point is that when you want to defend your right to leave in peace, freedom and justice you have to think that this right ends where the same right starts for the others. You cannot claim the need of a state or a land without respecting the same need of the others, in particular if the others were living on that land before you. If you do that you have only one solution: occupy with force. And when you occupy a land with force you have three possibilities with the local populations: wipe them out (like we did with Indian Americans) put them in reserves (as we did with Australian Aboriginals) or chase them away (as we are doing with Arab Palestinians). All these cases, and many more, happened with the use of force and violence but the difference is that the last one is currently happening under the eyes of the international community. And history will call us all more and more accountable of the things happening around the world nowadays, because the international community is every day more and more informed and cannot say “I didn’t know”. Mahatma Gandhi also said: “as the means so the end; the means may be likened to a seed, the end to a tree”. So if you claim peace waging wars you will never have peace, this is another logic and natural law. We saw that too in our humankind history. Since the beginning of its existence Israel has been seeking to defend itself from the attack of the neighboring Arab states using counter or preventives attacks. It was his right as it was risking its survival, but how Israel actually born? It born with a unilateral imposition because the people living in Palestine and the Arab leaders never accepted the UN Partition Plan Resolution 181 to create from the Mandatory Palestine two independent Arab and Jews states. One million Palestinian were forced out of their homes and every year Palestinians remember the foundation of Israel as the Nakba, the ‘Great Catastrophe’. So when you impose something unilaterally with force, as Ben Gurion did in 1948, the result that you get is a contrary reaction based also on force. Again it is a logic and natural law, and we human beings are natural beings, as we follow the Golden rule that is derived from the third Newton’s law of motion: “when one body exerts a force on a second body, the second body simultaneously exerts a force equal in magnitude and opposite in direction on the first body”. This is what is happening in Palestine since almost 66 years (apart that is not exactly ‘equal in magnitude’). Israel, with the approval of the UN, occupied a land violating the principle of national self-determination of the people 66 years ago and the result was that Israelis had their state but at the expenses of the Arabs and also at their own expenses, as Jews in Israel are leaving since then in fear all their life. Which kind of life is that? Is the life that Zionism legitimate looked for the Jews? It doesn’t seem so to me. It seems more that Israel went far from its original survival need with the wars, the settlements in occupied territories and recently the invasions of Gaza. And also with the construction of walls that made the Palestinians living in prison (besides than in refugee camps). As we know if you want to defend yourself you can build walls, and in the short term they may have a positive effect on your defense, but if you don’t address the root causes at the base of the attacks against you finally news fences are just going to call for more attacks. Also because the Israelis Gaza and West Bank barriers are not like the Great Wall of China or the Berlin wall, that were built to avoid invasions and migrations. The walls build by Israel are there to avoid the attack of people that have been displaced from their land since almost 70 years and are looking for their freedom and rights, having lived their lives for generations without them. Besides that these walls have the effect to keep those people in a trap and under siege. For example Gaza has only one little exit in the south with Egypt and the government of Egypt today, with General El-Sisi, is not exactly interested in defending or welcoming friends of Muslim Brotherhood as the Palestinians. So what do you expect from people being displaced, killed and put in trap if not fight for their survival with the tools that they have, from the rocks to the rockets? If Israel wants to have a brighter future instead of keep living in misery and fear needs to have a cultural revolution. A cultural revolution based on humanitarian values and universal justice, stopping to look at his small garden, that is actually very far from the paradisiac promised land they dreamed for millenia, and glance up towards the world, embracing the brothers of others faiths and looking for a pacific cohabitation in the ‘sacred land of all’. And the Arabs have to do the same: Palestinian state has the right to come into existence after so many decades but if Hamas keep defending that rights with rockets and calling for the disappearance of Jews state they are not going far for the settlement of disputes in Middle East. Cultural revolutions needs a long time but they can start as soon as we want, we just need a small gesture, that require however an enormous shift in our and other’s mind, a small gesture that Madiba Mandela was able to do already in his tormented land twenty years ago. It is called ‘reconciliation’. Reconciliation is based on apologize and forgive, two actions that have the same root, they come from the humanistic principle of “I care” and they can replace the hatred principle of “I don’t mind”, that is at the base of revenge (as Don Milani, a Florentine educator, proposed in his educational revolution). If we care we will be able to apologize for the suffering inflicted on both sizes and so we will be able also to forgive as everybody is guilty in a war. If we want to look for peace instead of eternal war we need this cultural shift, in Middle East as everywhere. We need to emphatically embrace the suffering of the others and put ourselves in their shoes to understand their needs and legitimate goals. Is very difficult to do it in an area in conflict since generations, with total lack of empathy between the two parts, but is the only solution. An eye for an eye will make the whole world blind but a hand shake for a hand shake could make the whole world less afraid and more trustful. It seems impossible but we can do it, it just take a little courage from the people. And a lot of courage from their leaders, who may risk to become martyrs as Rabin or Sadat (like Martin Luther King and Gandhi too). As a matter of fact this is what we miss today in Middle East: great leaders that appeal to the real core principles of the Abrahamic religions, the humanistic principles of love and compassion. But Palestinians and Israelis can push their leaders to do so if they want, instead of voting and supporting radical and extreme parties. That is why the cultural revolution is urgently needed, hopefully trough the education of new generations. As Mandela when he was in prison felt empowered by the message of self-mastery of the famous Invictus poem also today those people in the prisons of their fears might be empowered repeating this to themselves and to the others: “I am the master of my faith, I am the captain of my soul”. 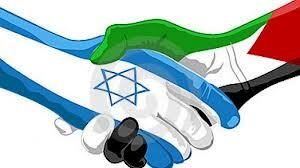 Let’s hope and pray for a free and peaceful Holy Land one day. Previous PostSecond Amendment: is the time arrived for constitutional reforms also in the US?Next PostFrom democracy to tyranny: is Israel, our “Western democratic” product in the Middle East, going downhill the Agamben “state of exception” or the Plato Tyranny regime?